NETBALL—Ugandan netball is in a bed of roses arguably the best moment in the history of the sport in the country. The She Cranes heroics of winning the African Netball Tournament was no mean feat. They have improved from 13th position to 9th in the world netball ratings and qualified for next year’s Commonwealth Games. Such accomplishments get noticed. And so a resolution was passed in Parliament on Tuesday to pay a special tribute to the She Cranes for winning the 2017 African Netball Tournament in Kampala. Led by inspirational player Peace Proscovia the Vincent Kiwanuka-coached side trounced Malawi Zimbabwe, Zambia, Botswana and Namibia in front of the partisan crowd to lift the coveted crown. The motion for the resolution was moved by Masindi Woman MP Jalia Bintu and seconded by Oyam Woman MP Santa Alum. Shadow minister for Sports and Makindye East MP Allan Sewanyana, commonly known as ‘Musajja Wa Bwino’ in Sports circles, took the bar higher proposing that each Member of Parliament contributes Sh500,000 toward purchase of bus for the national team as a token of appreciation to the gallant ladies. The House was unanimous in agreement. Part of the Sh244 million pledge will be directed toward construction of a modern netball court for the national team. The She Cranes have been a common chapter on the pages of financial constraints in preparations for major events. For last month’s African Netball Championships, Uganda Netball Federation needed Sh750 million to prepare both She Cranes and U21 She Pearls for games. The latter is currently enduring a splendid tournament in the World Youth Cup in Gaborone, Botswana. In 2015, the sports fraternity in the country hit ignominy buttons when She Cranes players had to organise a car wash drive to crowd fund for their participation in the Netball World Cup. Meanwhile, in Botwsana today, the She Pearls entertain favourites Jamaica looking for a victory that would guarantee them first-place finish in Group C in the final day of preliminary round games at the ongoing Netball World Youth Cup. The high flying and unbeaten Ugandan U21 side has been a team to beat in a “group of death”, winning three consecutive games to secure a quarter final berth with a game to spare. The David Bogere-coached side annihilated Malaysia 81-21 in their tournament opener, followed with a hard-fought 46-42 victory over hosts Botswana and a comfortable 52-36 win over point donors Cook Island yesterday. Now standing in their way are the highly fancied Jamaicans, whose surprise 48-46 loss to Botswana has put their chances of progression in jeopardy. The Jamaicans, ranked 4th in world, will pose a much bigger threat to Ugandans compared to the other victims that have tested the wrath of She Pearls. Yet Uganda’s hopes of leaving the Jamaican duel with bragging rights will greatly hinge on performances from Captain Joan Nampungu, GS Irene Eyaru, C Player Betty Kizza and GA Sharifa Nalunkuma. The quartet has been at heart of every good achievement the She Pearls have scripted thus far. She Pearls are looking good to compete for top honors at the prestigious event. The top eight nations will be re-grouped in two groups to decide the semi-finalists. 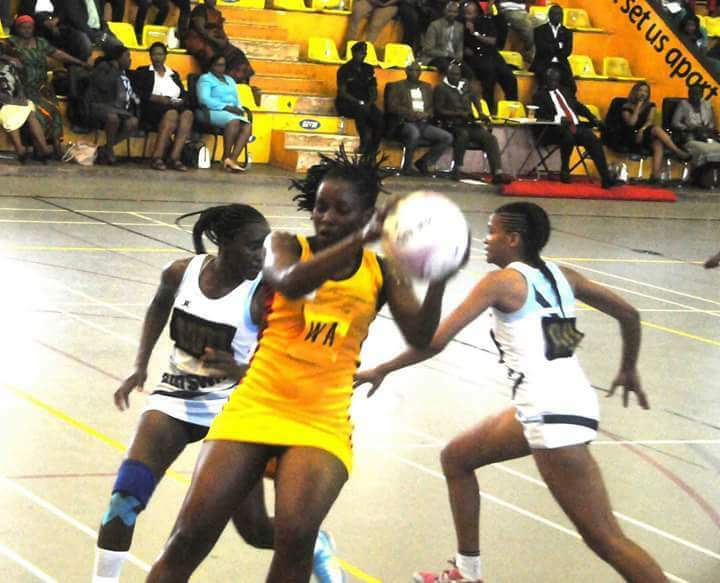 The Netball World Youth Cup, the first event to be held in Africa by International Netball Federation, is the pinnacle of net ball competition for emerging players who under 21 years of age.